“I step outside on the veranda, it is a beautiful afternoon. I stop for a moment to admire the incredible landscape that stretches in front of me. The question I’m asked most often is whether I ever get tired of living in the same place all the time. Have you ever wondered how prosciutto is made? Or how saffron is grown and harvested? What it’s like to live on an organic, self-sustainable farm and daily prepare the farm-produced food for family and guests? 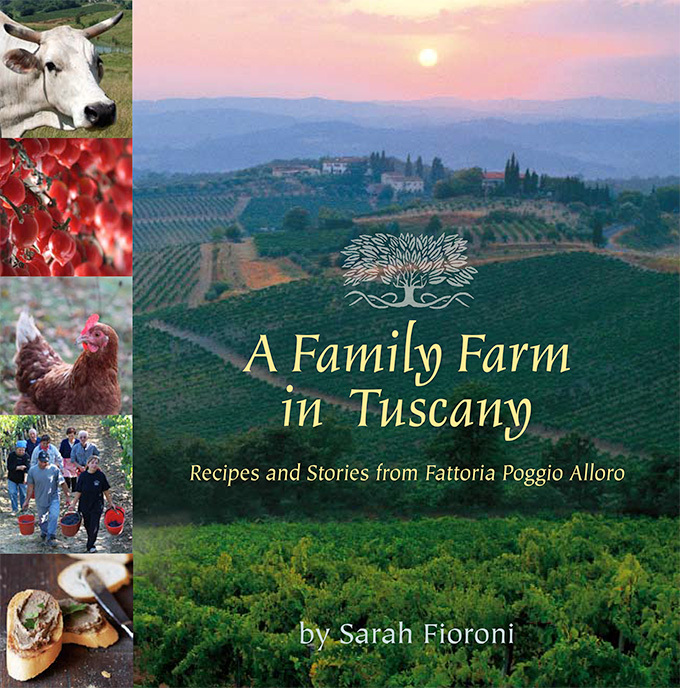 Sarah Fioroni, executive chef, sommelier, and general manager of Fattoria Poggio Alloro near San Gimignano, Tuscany (Italy), shares stories of family traditions and daily life as well as recipes in her book, A Family Farm in Tuscany: Recipes and Stories from Fattoria Poggio Alloro. Sarah provides a month-by-month glimpse of farm living as well as seasonal recipes. Her recipes are simple yet so delicious, and easy to prepare in your kitchen. The book is illustrated with hundreds of colour photographs depicting the landscapes, crops, as well as the family at work and at the table. Open the pages of this book and visit Poggio Alloro from your favourite chair, then prepare recipes and experience the taste of Tuscany in your own home. Sarah Fioroni is the third daughter of Amico Fioroni and she now runs the farm, together with her family. She is an AIS-certified sommelier, president of the Associazione Strada del Vino Vernaccia di San Gimignano, a certified teacher for the Fattorie Didattiche program for schoolchildren, and author of the book A Family Farm in Tuscany. 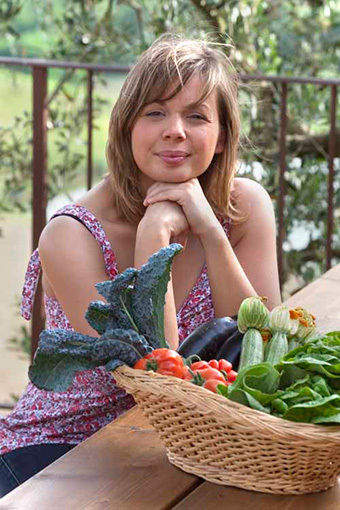 She often travels to Europe, Canada, and the US to promote the farm’s products and her book. She also teaches cooking classes at the farm and in the United States, where she often appears at food and wine events and to conduct demonstrations and workshops. Interviews with Sarah have appeared in newspapers, magazines and on television in many countries. Various magazines and newspapers have written articles on the farm, such as La Nazione, Il Tirreno, Terre dl Vino, Quattro Ruote, Il Sommelier AIS. Fattoria Poggio Alloro has been also cited in the guide books Touring Club, Wine Trails, and Michelin guide. Abroad: Le Figaro, Guide Evasion, Der Feinschmecker, The Japan Economic Research Institue, Organic Gardening, San Antonio Express News,and the book by Barbara Kingsolver Animal, Vegetable, Miracle. An article on the farm and the three Fioroni’s brothers by Sarah Fioroni has been published in Healthy Aging.